For 750 years the Moors ruled Granada—the wealthiest city in Spain. New ideas in philosophy, mathematics, medicine, art, architecture, and poetry were introduced. One of the Moors’ greatest legacies is the Alhambra, now one of Spain’s architectural treasures. Nearly 500 years have gone by since the fall of Granada. In 1492, the same year that Columbus reached the New World, the Moorish king handed over the keys of the Alhambra to the Catholic monarchs Ferdinand and Isabel, who had played on the jealousies and rivalries of the last ruling Moorish family of Granada to complete the reconquest of Spain. Before the fall of Granada, Isabel made a vow that if she were successful in retaking the city, she would build a convent at the Alhambra. 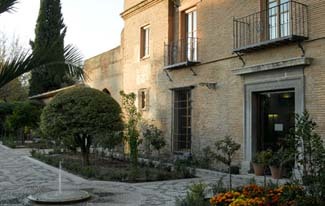 Today this convent is the Parador de Granada. Isabel chose the site of a mosque and palace built by the Nasrid amir Yusuf I for her convent. The High Chapel of the convent was established in the center using some existing Moorish arches and plasterwork, and then surrounded by living quarters. The bodies of Isabel and Ferdinand were temporarily buried here until the completion of the cathedral of Granada in 1521; a small chapel marks the site. Reconstructed at various times, the convent eventually fell into disrepair and was variously used as a barracks, storehouse, retirement home, and school for landscape artists. Finally, the government rebuilt it as a parador in 1944. Even if you don’t stay at the parador, splurge on dinner, and afterwards, stroll around the gardens; it’s magical. The smell of the orange blossoms in spring and summer are amazing. Reserve this parador far in advance; it’s Spain’s most popular (and one of the most expensive). Also, try for a room in the older part of the building. Because the Alhambra is Spain’s greatest tourist attraction, the overflow of people can affect the parador during certain times of the day. Note that even though you are technically on the grounds of the Alhambra, you must pay a separate admission to enter the Alhambra proper. Make a reservation for this in advance, if possible. Granada is linked by all means of transportation to Spain’s major cities. If driving, follow the signposts around the city. The parador is to one side of the Alhambra. Nearby: the Alhambra and Generalife palaces. Come to the Parador de Granada for the Alhambra but also for its lovely gardens, which are so peaceful in the early morning or evening. Close your eyes and listen to the soft sounds of the birds and fountains; smell the roses and be carried back to the enchantment of Washington Irving’s Tales of the Alhambra. From here, views of the red-roofed houses of Granada and the snowcapped Sierra Nevada are unsurpassed. Today this parador is the most popular in Spain. It’s lobby and public rooms are filled with antique wood santos (carved figures of saints), carved tables, copper pieces, El Greco reproductions, and works by modern regional artists. Long corridors lead to the guest rooms framed with carved doorways. Rooms have been remodeled in an unfortunate (my opinion) contemporary design. Windows look out over views of the gardens and Generalife Palace located across a ravine. Tapestries, embroidered piecework, and copper and iron craftwork decorate the restaurant. The menu offers traditional Andalucian cuisine. The parador is on the grounds of the magnificent Alhambra.